Between the sharks doing completely different dance moves, Katy Perry’s outfits, Lenny Kravitz singing four words and Missy Elliot’s weird long hair, this year’s Super Bowl halftime show was as trippy and odd as any show I can remember. Obviously I’m going to focus on Katy Perry’s first outfit because it’s not every day that a dead wrestler trends worldwide during a Super Bowl halftime show. It was probably the best part of the show, besides maybe the sharks just going rogue and doing whatever the hell they wanted. 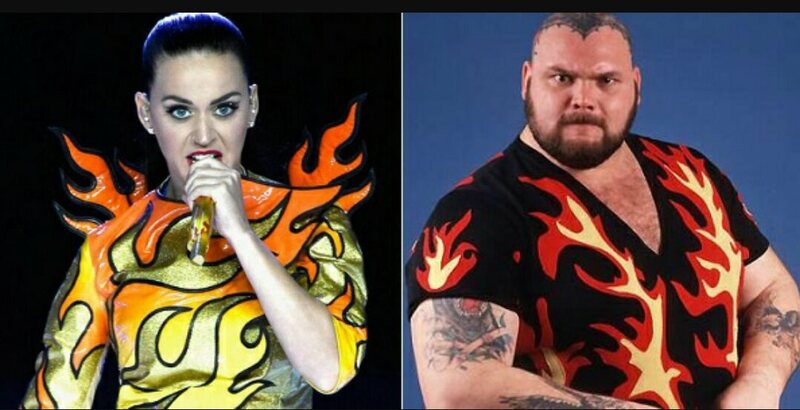 My only complaint is that Katy Perry didn’t go full Bam Bam and shave her head and get a flame head tattoo. You can’t just wear that outfit and not have a head tattoo. They go hand in hand. Another missed opportunity by Katy Perry. Posted on February 2, 2015, in Average Blog Posts and tagged bam bam bigelow, halftime show, Katy Perry, missy elliot, Super Bowl. Bookmark the permalink. Leave a comment.